Mario Gotze is a German professional footballer who plays for Germany's national football team and German club, Borussia Dortmund. Born in Memmingen, Germany on 3 June 1992, Gotze is basically a right footed player but can also score goals from his left foot. He plays in the team as an attacking midfielder and is widely regarded as one of the best young footballers in the world because of his speed, technique, dribbling skills and playmaking. Götze came to Dortmund at a naive age of 6 when his father got a job in Dortmund University. His father recognised his talent and was convinced to let him make career in Football. Before making his debut as a young player for Borussia Dortmund, he had also played for SC Ronsberg and FC Eintracht Hombruch between the years of 1995 and 2001. At the age of 9, he joined Dortmund youth academy and worked consistently hard to make progress through various youth teams including national level teams. Playing with Germany U16, he featured in 8 fixtures and scored 3 goals whereas next year, he hit 5 goals in 13 games for Germany U17 team. On 21 November 2009, Götze played his first Bundesliga game against Mainz 05. In this scoreless draw, he had come on as a substitute for Jakub Błaszczykowski. In the 2010-11 season of Bundesliga, Götze emerged as a significant performer for the club. His 8 goals and 11 assists during the season helped his team to win the league. His international debut for Germany came on 17 November 2010 against Sweden. Coming in the 78th minute of the game, he was a substitute for Kevin Großkreutz and like his first club game, this one also ended up on a draw. He was just 18 at the time of his debut, which also made him the youngest player since Uwe Seeler to play for Germany’s international side. Returning from his hip injury, Götze finished the 2012 season with 7 goals and 8 assists, winning the Bundesliga and DFB-Pokal for Borussia Dortmund. In the 2012-13 season of DFB-Pokal, he claimed a hat-trick against Hannover 96 in the third-round game and won the match for his club by 5-1. In the 2013 Champions League, against Ukrainian club Shakhtar Donetsk, he helped the Dortmund to advance into the quarter-finals for the first time in 15 years by netting a goal and providing a significant assist. 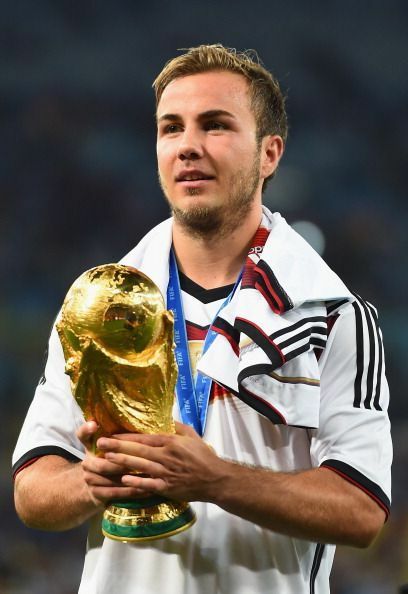 In April 2013, Götze moved to Bayern Munich and on 17 December in the semi final of FIFA Club World Cup against Guangzhou Evergrande, he scored a long-ranged goal, helping his team to win the match and storming into the final of the tournament. Playing with Germany, he netted 4 goals to help his team to qualify for the 2014 World Cup. Götze remained expressive whenever he got a chance in the tournament but it was at World Cup final when he had his moment that will always remain in German football folklore. In the final, he scored the only goal of the match in the 113th minute, giving Germany their 4th World Cup. Götze has started his career with Borussia Dortmund in 2009 and played with the club till April 2013. In this period, he appeared in 83 games for the club and claimed 22 goals. Between 2013 and 2016, he also played 73 games for Bayern Munich and scored 22 goals. In July 2016, he returned to Borussia Dortmund. With his first international goal against Brazil on 10 August 2011, Götze became joint-youngest scorer for the Germany in the post-war era. He is also the youngest player since Wolfgang Weber to score a goal in the World Cup final. In 2009, he was awarded UEFA European Under-17 Football Championship Golden Player trophy. He was also the Young Player of the Year for 2010-11 Bundesliga. In 2014, his goal for Germany was recognised as the Goal of the year. 5 players from Germany's 2014 World Cup-winning squad who are unlikely to feature in Russia 2018.